The M4-ATX-HV Automotive CarPuter power supply extends the input power voltage range of M4-ATX PSU by another 4V. Now you can input 6-34V with 220W (275W peak) power. M4-ATX-HV is an intelligent, high power, vehicle (car / boat / electric cart) DC-DC ATX PC power supply designed for use with a carputer or general purpose battery powered applications. Designed to provide power and to control the motherboards’s ON/OFF switch based on ignition status, M4-ATX is a wide input (6 to 34V) vehicle / car / battery operated ATX power supply capable of surviving tough car engine cranks (down to 6V) as well as transient over-voltage situations. Connect it to your car / boat / RV / solar battery and power up your PC! – Programmable shutdown / sleep modes via optional serial cable. – Fits any motherboard equipped with a 20 or 24pin ATX connector. – 100% silent, fanless, no moving parts. – Operates from 6-34V, multi-chemistry batteries supported. – Highly efficient design, does not produce a lot of heat. – Works with any Intel Core Duo as well as all VIA or AMD processors. 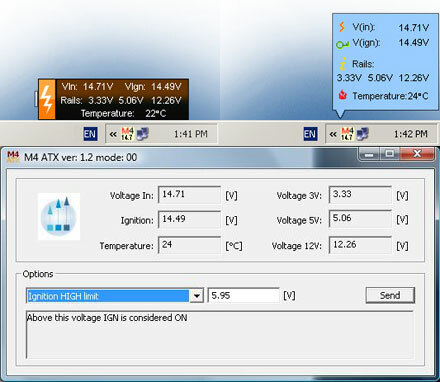 When you connect M4-ATX-HV by USB with your PC, then you can control voltages and temperatures with the control software. With the Advanced software version you even are able to change the behavior of the power supply.